Ghaziabad is a renowned city in the Indian state of Uttar Pradesh. It is sometimes referred to as the "Gateway of UP" because it is close to New Delhi, and the first city on route into Uttar Pradesh. The city of Ghaziabad was in AD 1740 by Wazir Ghazi-ud-din, who named it Ghaziuddinnagar after himself. Ghaziabad is also prominent in first freedom war the Indian independence movement the for its association with the mutiny of 1857. During that war, there were fierce clashes between the British forces and Indian Worrier’s sepoys on the banks of river Hindon, where the checked the advancing British forces coming from Meerut. Ghaziabad received its first railway station in the 1864 the structure of which still exists & is being used daily by more than 2 lakh passengers who visit the city for one purpose or the other. We all know that art has always been instrumental in facilitating social cohesion, bringing tourism to unlikely places, fostering a sense of belonging and preserving the collective memories. In order to preserve the historic beauty of ‘Ghaziabad Railway Station’ it being constructed during the British reign csDishaa Foundation started a campaign of renovating it. We have started converting it to the “First War Painting Museum based on the first Independence War of 1857 in India”. Dr. Udita Tyagi, the Founder of csDishaa Foundation states: “We are working on a unique city vision to be created through the art and culture, which will help in recognizing the comWar work internationally and nationally. The Railway Station Museum with paintings of the war of 1857 is first of its type in India. It is one of those rare opportunities where the people of Ghaziabad can become a part of history by helping the volunteers to conserve what is their very own cultural heritage Ghaziabad Railway Station. To make it happen, csDishaa welcomes individuals, businesses and organizations to come forward and support in making this “Mission 1857- The Museum” a grand success. 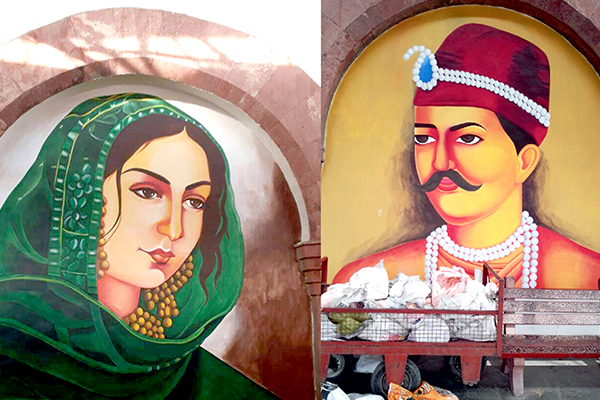 csDishaa believes that the people of Ghaziabad can make an excellent contribution to the society by empowering & appreciating students, who are trying to conserve and paint the arches at the Railway Station. In this process of conservation the people of Ghaziabad will also develop a sense of ownership in their heart. Dharmpal, a taxi driver, shares his experience, “I have been coming to this railway station regularly to pick and drop passengers for the past four years. The station was never so clean. People are becoming aware of the importance of cleanliness now”. The sanctity of law can be maintained only as long as it is the expression of the will of the people. Hence csDishaa would like to make one appeal to all citizens of Ghaziabad, “Let’s all come Forward, Join Hands & Make Our City Clean & Green For a Better Tomorrow”.